Disasters often serve as catalysts for innovation. That is why, starting in 2008 and spurred further by the 2010 Haiti earthquake and the deadly tsunami-induced floods of 2012 in the Philippines, the National Library of Medicine began to pioneer new disaster technologies, such as TriagePic. TriagePic is a software application that helps to track hospital patients and find their loved ones during disaster emergencies. 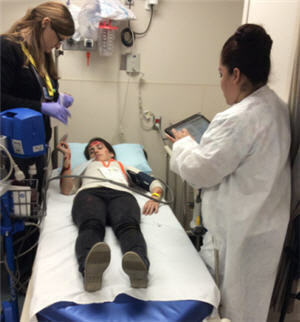 During a recent regional disaster drill conducted by Suburban Hospital, in Bethesda, Maryland, TriagePic excelled at locating volunteer “patients” and tracking them through the hospital, according to Michael Gill of the Communications Engineering Branch at NLM’s Lister Hill National Center for Biomedical Communication (LHNCBC). The software is similar to NLM’s community-oriented PEOPLE LOCATOR®, Web site and ReUnite®, NLM’s initial downloadable iPhone app. ReUnite first saw service in the aftermath of Haiti’s 2010 earthquake. TriagePic operates as an online “lost and found” serving as a database for information gathered at the hospital including name, gender, age, health condition, and photo that emergency officials can search during disasters. These systems are part of the Lost Person Finder project, which includes several supporting applications aimed at smartphones and other mobile devices, and also teams with third-party applications, including the Google Person Finder, to facilitate simultaneous searches of similar family reunification databases. 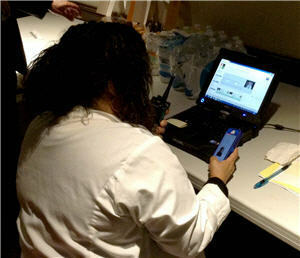 Developed by the LHNCBC, the disaster software project is part of the public-private Bethesda Hospitals’ Emergency Preparedness Partnership (BHEPP), which began in 2008. The LHNCBC team includes Michael Gill, Sameer Antani, Glenn Pearson, Greg Miernicki, Leif Neve, Zhirong Li, Tehseen Sabir, Byte Phichaphop, Lan Le, Sonya Shooshan and George Thoma, the Branch Chief. Once TriagePic moves beyond the test phase, Gill and his colleagues say hospitals nationwide can download the free software as a tool in their kit to speed family reunification after large scale disasters. For more information, please visit the Lost Person Finder Web page, http://ceb.nlm.nih.gov/proj/lpf.php.